That does make a nice change Terra! What a show girl this one is TT. the tulip helped me by posing nicely for its photo..Lol. Tut I don't know so its a poser then lol hehe. Yes stunnng ... I have never been a fan of Tulips.....but this year I seem to have fallen in love them. I planted some yellow ones and thay were beautiful, I will have to post a photo of them, but yours TT is Stunning! Whoa! That is a STUNNER!! I love it! Going to faves..it reminds me a bit of one of the ones on my blog...but it's even nicer than 'Rem's Favourite' I think! WOW How gorgeous - you must have green fingers! Gorgeous!!! Where did you find it? Wanted to ask, have you heard of GEETEE bulbs? They are wholesalers with a love for tulips, according to their website, with a link to a shop for private gardeners. After being very disappointed with J Parker I'm treading cautiously, but I wondered if anybody had ordered from them, and had good results? 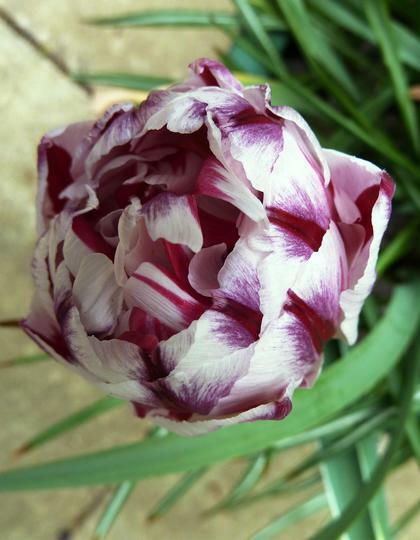 This tulip came from a local garden centre .. I suppose, with some online places you get more of a choice, as well. Thanks again!